At about 7:30 p.m. on January 24, 2019, a bus driving east on Route 80 hit the median and went airborne. When it landed, it crashed into three passenger cars. As a result of this horrible bus accident, one person was killed and at least thirty-six people were injured, two of them critically. The fatality has been identified as a college student who was returning home to see her family. As of this writing, the police are still investigating the cause of this horrible accident. According to the federal government, in 2005-2006, about 5 percent of large vehicle accidents included buses nationwide. In NJ, this number was 14 percent. A government report for North Jersey for that two-year period, reported 39 bus crashes in that area that caused serious injuries. Once such accident actually involved two buses. Because they travel with many passengers and can cause such human harm, bus companies must adhere to higher standards than other vehicle owners. Bus owners are required to keep their buses working well to protect the safety of passengers and the public at large. Did you or a loved one sustain serious injuries due to a bus crash in NJ? Don’t let the medical bills pile up while you wait for the negligent party or their insurance company to do the right thing. Right now, you need an aggressive personal injury attorney on your side, fighting to get you the compensation you need, want, and deserve. 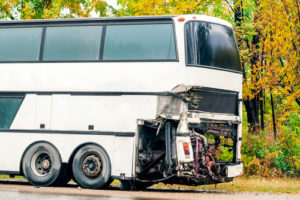 The skilled attorneys at Hoyt & Hoyt represent clients injured because of a bus accident in New Brunswick, Perth Amboy, East Brunswick, South Brunswick and throughout New Jersey. Call 973-292-2299 or email us to schedule a free consultation about your case. We have an office conveniently located at 67 East Park Place, 5th Floor Morristown, NJ 07960, as well as offices in New Brunswick, NJ.